The location of Broome means that our sunrise and sunset times do not vary a great deal during the year. The variation is only about 90 minutes and we don’t have “daylight saving”, so the clocks never get changed. Various governments have forced us to trial it in Western Australia in 1975, 1984, 1992 and 2006 and we have then had to vote on it and it has been rejected. I think they have given up now and they are unlikely to trial it again for some years. This means that the birds are currently awake and calling at 5am because it is summer! During the winter they hold off until about 6:30am, so we get to sleep in! Of course we could just shut the whole house up and possibly block out the bird calls, but realistically there are birds in our region that can call loud enough to be heard even if you shut your windows and doors. 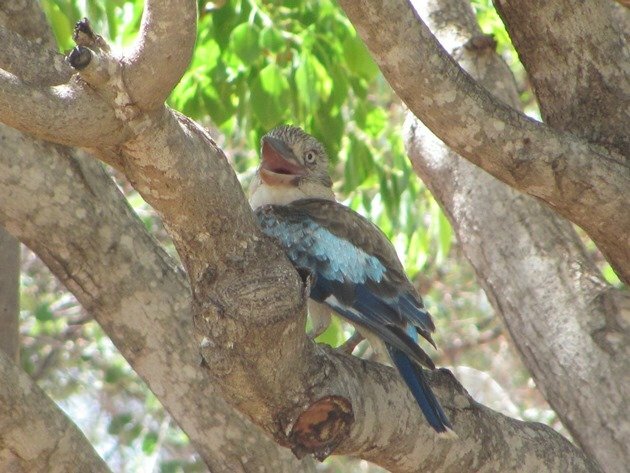 I mentioned last week the cheerful sound of the Grey-crowned Babblers awakening us with their chuckling, but often it is the Blue-winged Kookaburras that start up even earlier. Due to the cyclones that affect our region we mainly have underground power, so there are limited transformers above ground for them to perch on and call from. One of these transformers is at the end of the next street and is a perfect perch for them to call from in the early hours. Their other option is our “pretend power line”, which they also use throughout the day. 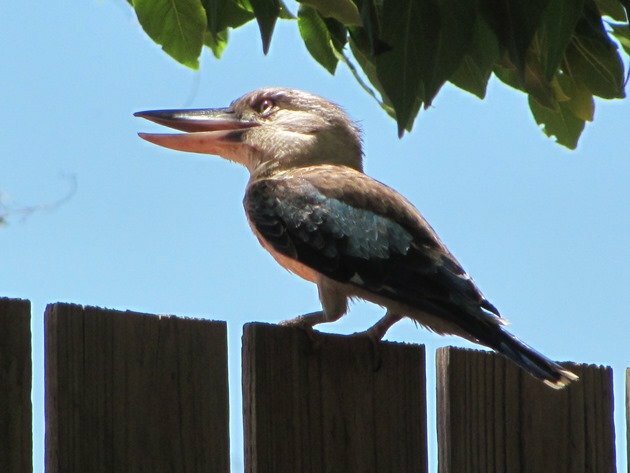 We have had some hot and dry days this week and the Blue-winged Kookaburras have been using our garden for shade as well as making a general racket first thing. 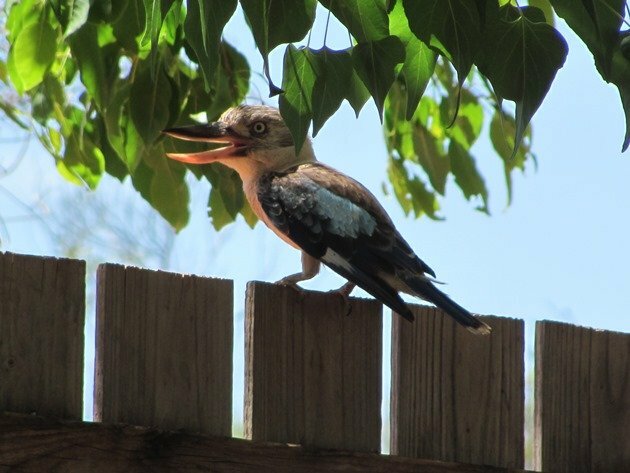 Most people are familiar with the laughing sound of the Laughing Kookaburra and the Blue-winged Kookaburra also calls, but sounds like it is not just laughing, but slightly mad and insane! In fact one of our Australian Field Guides has under “Other name”…. “Barking Jackass”….nothing else needs to be said!! Once they get going it is quite a raucous. 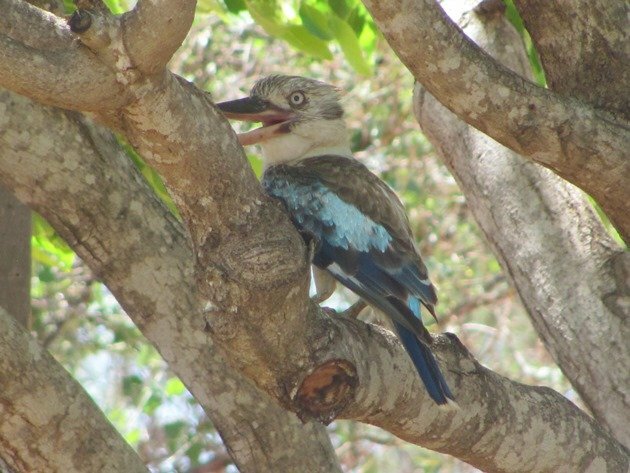 The Blue-winged Kookaburras have an impressive bill and mainly eat insects, lizards and frogs. 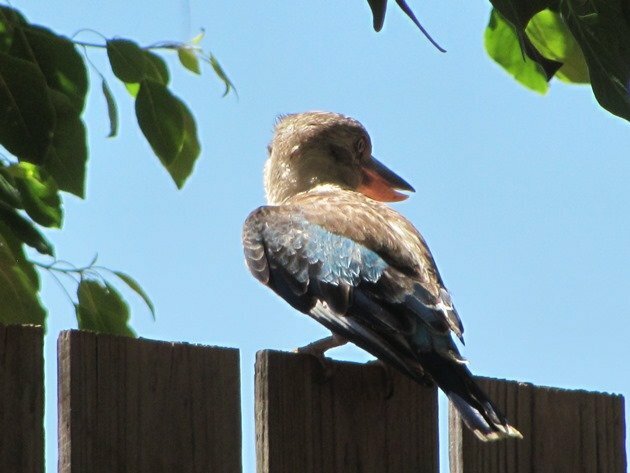 They inhabit the north of Australia and look like an over-sized kingfisher. I know it is too cold at the moment in a lot of areas for you to have your windows and doors open, but what birds awaken you throughout the year? 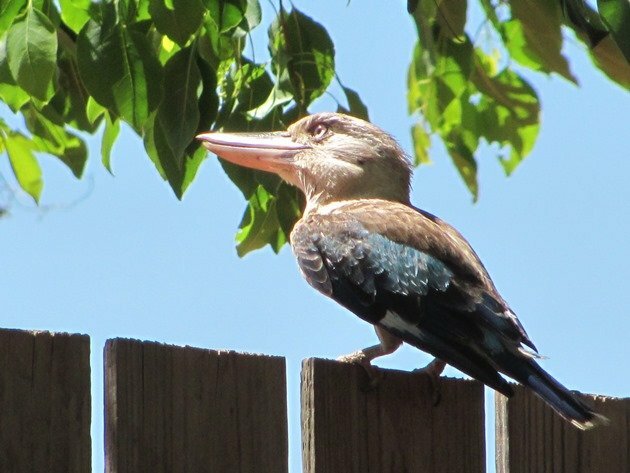 That is a gorgeous kookaburra! Here on the Olympic Peninsula, we are awakened not by bird calls but by bird drillings. 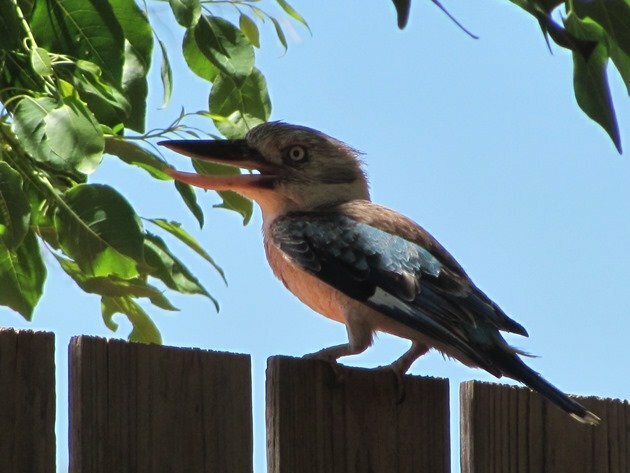 The Northern Flickers and Hairy Woodpeckers like to drill holes in our wooden house, and it can get very loud, and also very early in the morning. It must be an odd sound to have the drilling and no doubt you wondered what it was at first! We have a metal roof, so we sometimes have the pitter patter of birds on the metal to wake us up as well! When I was in Australia last month (actually on Maria Island in Tasmania which is about as far as you can get from Broome and still be in Australia, but anyway…) I noticed that it took two Laughing Kookaburras to make that horrible call. One of them was going KAKAKA and the other one was going HOOHOOHOO. 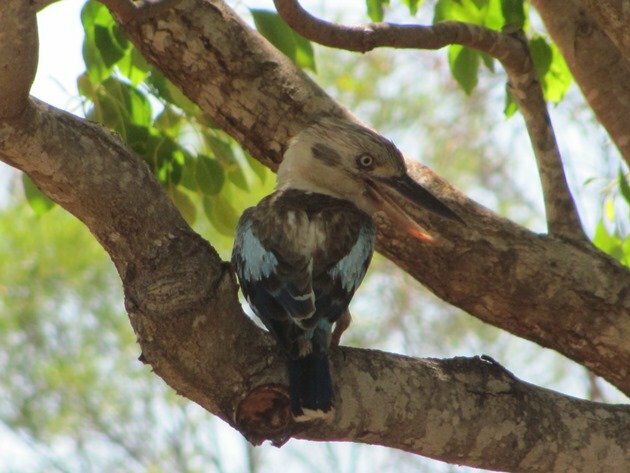 I hadn’t seen that mentioned anywhere I’d read anything about Kookaburras before.